After a mini break from the blog, I am glad to be back! And I'm not the only one who's back; the sunshine has come to stay for a couple more days (hopefully a lot more days) and I must say, this must have been one the best summers I've experienced in London in the 13 years I've lived here! Glorious sunshine, temperatures above 25 degrees every day, all the ice cream...what else does a girl need? Oh that's right, sun protection! I know we all need (and long for) some sun exposure especially when summer comes round after long miserable winter days. But too much unprotected exposure to the sun's ultraviolet rays can cause skin damage, eye damage, immune system suppression, and skin cancer. Remember sun rays are comprised of both UVA and UVB rays. UVA contributes to premature ageing and UVB to sunburns! So whether you're jetting off for a beach holiday or simply relaxing in the garden this summer, protecting your skin from the sun is a key step to achieving and retaining youthful radiance. And with this in mind, I wanted to share a product I found that works amazingly well for just that! Keep on reading to find out more! 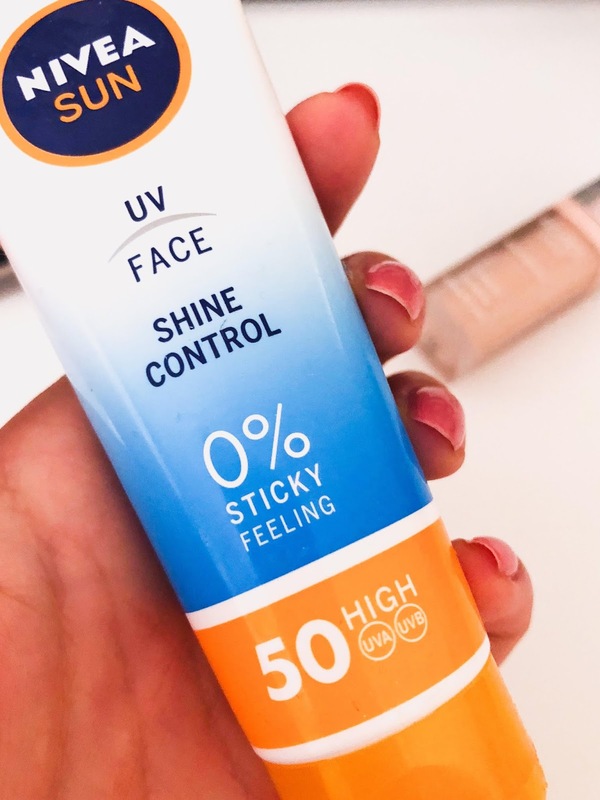 NIVEA SUN UV Face Shine Control Cream, designed for normal skin and boosting SPF50, provides highly effective and immediate UVA/UVB protection against sun exposure and other UV-induced face skin damage. The hydrating formula delivers an instant and long-lasting mattifying effect, particularly perfect for those hot summer days when you're bound to suffer from perspiration. It absorbs excess oil leaving your skin feeling light, non-greasy nor sticky. 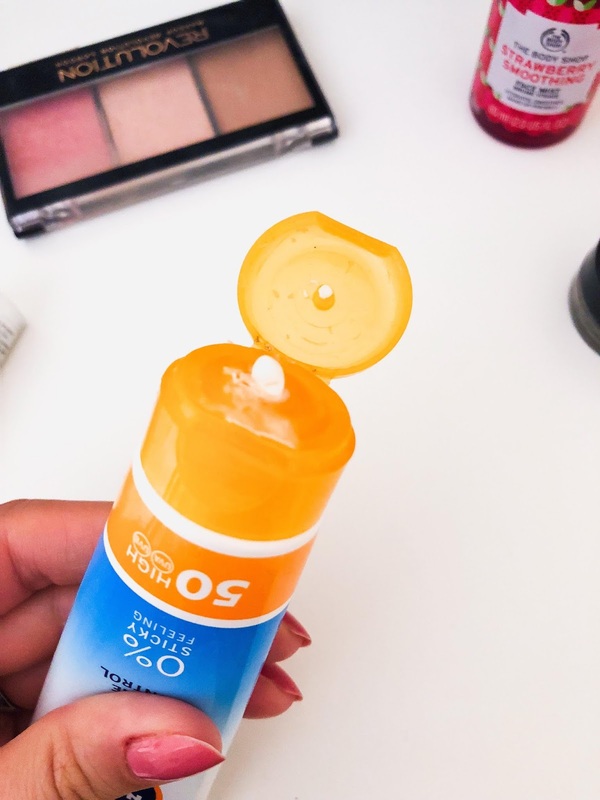 I've always been conscious of the damage the sun can cause and because of that, I've spent a small fortune trying to find high sun protection that works well for my skin. I've used sun creams from Vichy, La Roche Posay, Clinique and the likes, and you will agree with me no matter how good their products may be, these brands aren't the most budget-friendly. Which is why, when I saw this whilst doing my weekly grocery shopping at Asda I decide to give it a chance, after all, if it didn't work well for my face surely I could use it on the rest of my body. Little did I know that this would become one of my makeup bag staples! If there is one thing I detest is sunscreen that is sticky and leaves a white residue tint after drying, and I've found that most SPFs do just that, particularly those that are factor 50. Thankfully, this is nothing like that. This product gives me the full factor 50 protection without making me look greasy or with a white cast. It dries translucent almost instantly and it is 0% greasy which I appreciate, as my long hair doesn't stick to my face. In terms of scent and texture, it has a delicate smell which I don't find too different from other sunscreens and the texture is light and creamy making it pleasant to apply to your skin. And for a makeup lover like myself, I'm also happy to report this creates the perfect mattifying base to be worn under makeup without the need of a primer! I've been wearing this for the past 2 months ever since I picked it up and I may have found a holy grail not just for the summer but for all year round. I've taken it with me on holiday and it performed brilliantly meaning no sunburns and extra shine, which is reassuring as you really need that sort of protection whilst being more so exposed at the beach. I've also worn it to work and even after being on the tube for a good couple of minutes every day, my skin at the end of the day looks healthy and not overly shiny. The price tag is a nice little bonus (shop below) for 50ml, and despite wearing generous amounts every day (tip: that's the only way you will get the full SPF factor), it doesn't seem like I've made much too much of a dent yet. I have a feeling this little tube will last me a while and when it finally runs out, I will surely repurchase. Oooh, it sounds perfect for holidays and this beautiful weather in England! Great pictures too! It's a shame that it's mattifying. I need something that will work well for dry skin 🙈 Sounds like a great product though. I *think* they have one like that too, maybe worth checking it out. Tens que provar! É mara! I like summer products which are not sticky, I must buy this cream! SAME! A sunscreen that is not sticky is a godsend! Sun protection is key! Thanks for sharing! I have never heard of this sunscreen! I'm sure it will work wonderfully during this California heat wave! Oh definitely, do give it a try! Vai sem medo! É ótimo! Seriously what this summer needs. I'm in Mexico and the sun has been pretty agressive these weeks, not that I complain because I can never have enough of summer days. Great recommendation! Definitely give this one a try! :) Enjoy the Mexican sun! It is indeed almost perfect! This sure looks good. Would love to try this sunscreen. Thanks for sharing dear! It is so good for its value! I've just run out my sunscreen and this will definitely be a good try. Will buy it as soon as I can! Thanks for this lovely review and for convincing me. Oh I'm glad! Let me know what you think! I'll need to look for this! So far my favourite sunscreens are from Vichy. I love nivea products. This will be a great product for someone like me who has oily face. 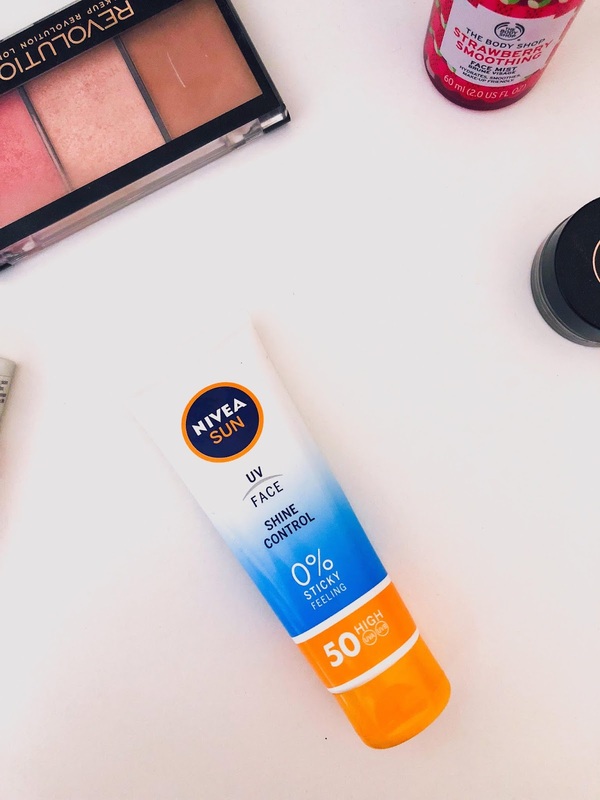 Same, Nivea is a household brand for us and this does not disappoint! Preciso desse protetor na minha vida! Fico sempre com a cara brilhante depois de por protetor, não gosto nada. Precisas mesmo! Espero que gostes!